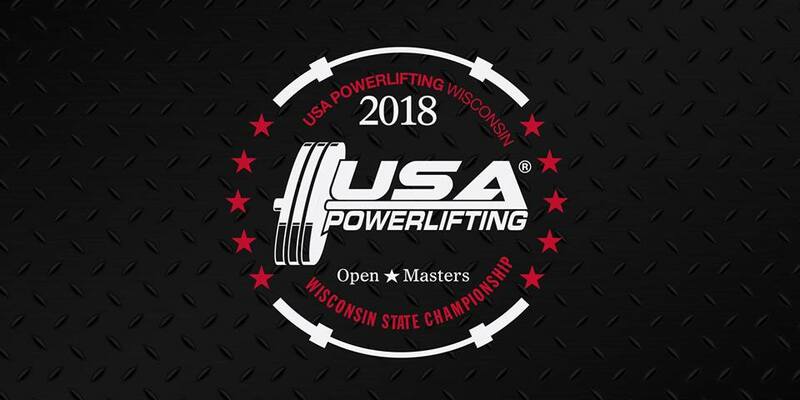 The 2018 USA Powerlifting Wisconsin State Open & Masters Championships is proudly hosted by the Racine Horlick High School Powerlifting Team and managed by experienced meet director, Tonya Lambeth. Three platforms running throughout the two sessions, staffed by team members, parents and alumni powerlifters. Warmup area is quite large and located within the fieldhouse. Good technology in use to allow athletes and coaches to keep track of their competition as well for the audience. Registration to open by first week of November. Watch for more information on this. Audience can arrive as early as 6:45 am to pay admission and nab the best seats. Competition to the following age categories of open and master Wisconsin members, women and men with a sanctioned USA Powerlifting meet total between the dates of January 1st, 2016 through December 31st, 2017. During the registration process, lifters will provide the USA Powerlifting rankings database link to the qualifying meet. All Wisconsin lifters will be scored in the Open category including the Masters. During registration, Masters will also be able to sign up for Masters State Championship for additional fee. Teenagers will be in session 2 and will participate in the Open age category. Great opportunity to compete with a bench shirt and/or qualify for the ’18 USA Powerlifting High School Nationals held in March right here in WI (Appleton). Should there be any questions regarding this, the coach is to contact the meet director, Tonya L.
This competition, both sessions, is closed to youth lifters. Open category is defined as lifters age 14 and above. In 2019, there will be established minimum qualifying total standards, by weight class for both equipped and raw competitors. The top three overall finishers (male and female) will be recognized on the awards podium for each weight class, raw and equipped in the age categories of open and masters. Top of the podium will be the state champions. Out-of-state guest competitors will be allowed with the same qualifying standard as the WI members, one overall award for all female equipped and raw and one overall award for all male equipped and raw. This session will also include the bench only portion of the meet. First flight lifting starts at 9:00 am on each platform. Competition open for individuals, Wisconsin members and all other state members, who have not yet competed in a sanctioned USA Powerlifting meet or not after January 1st, 2016. A great opportunity to get on the platform for the first time or to get back in the game. Should you consider yourself still a rookie even though you have been in a USA Powerlifting meet before, you can register for this session and enjoy the day with less pressure. Completed total in this competition can also be used for regional and national level competitions, in correlation with the established standards of each. Teenagers/high school students will lift in this session. First flight lifting starts at 2:00 pm on each platform. The top three overall finishers will be recognized on the awards podium for all female and male competitors – Wilkes age-coefficient to be utilized. There will be no separate masters, junior, or teenage scoring categories. Competitors from first session receive free admission to this session and those in the audience from first session are encouraged to stay on as their previously paid for morning admission. As with all sanctioned USA Powerlifting competitions, we strive to uphold the USA Powerlifting mission statement as much as possible. Taking any prescribed medications – hone in on the content specific to therapeutic use exemptions and WADA database cross checking. Friday, January 19: State member meeting from 7:30 to 8:00 pm. All current USA Powerlifting Wisconsin members are invited to attend.